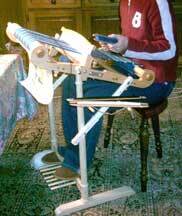 The Kromski Harp Forte Rigid Heddle Loom stand gives you the convenience of weaving wherever you would like. No need to find a suitable table or counter. Weave on the back porch one day, under the tree in the backyard tomorrow, upstairs next week and so on! You'll never have to worry about where to place the loom while you answer the door, and direct warping is as easy as pie. • the stand can hold your loom when you use the warping board on the back of the loom. • the stand stores the warping pegs. This stand can also be used with the Fiddle loom. Use the floor stand to hold the loom while warping, even with a project on the other side. Fold the loom while on the stand to save space. Use the side pegs to hold yarn for your stick shuttles. Use the side pegs to hold your shuttles.